John and Philapina Summer immigrated from Austria and Germany, respectively, to Denver, Colorado in the early 1870s. John became a successful saloon owner in several mining towns: Georgetown, Big Chief, and Empire. As the mining boom slowed, John began to look towards a move and a change in profession. Philipina wanted her husband to consider ending his saloon days and move to a ranch, which she felt would be a better life for the children. John Summer and two neighbors made the difficult trip in wagons over Berthoud and Gore Passes into Northwestern Colorado. He took over a homestead relinquishment in Sidney in 1889. At that time, Sidney consisted of a saloon, post office, and only a few homes. Two local men were hired to build the family a home in the tiny settlement of Sidney, eight miles south of Steamboat Springs. Two of John's sons, Louis and John, arrived in the valley soon after, making a dramatic trip from Empire, Colorado. Louis was only 13 years old. The young boys arrived before the rest of the family, and helped their father prepare the new home for their arrival. Philipina and the other children arrived later that fall. After the land was cleared of sagebrush, the large, ambitious, and hard-working Summer family produced oats, barley, wheat, and potatoes. They also raised cattle and began a dairy farm. Here, the Summer children learned about hard work and good farming practices and wrested a living from the soil. Years later, Louis, his wife, May, and their two children, Evelyn and Vernon, took over the original homestead property. Vernon shared a love of the land, passed down from his grandfather and father. Vernon was tall and athletic, and thrived in this rural life. He enjoyed hunting, fishing, and riding horses. 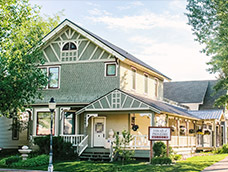 Vernon became an iconic connection between the old homesteading, ranching days and the newer ski industry in Steamboat Springs. He was a ski patrolman for years. He often hiked up into the mountains, to get the �wide view� of the Yampa Valley. Vernon remained a part of the ranching community and won awards at rodeos for calf roping. He was also a swimmer, ski jumper, and an accomplished downhill and cross-country skier. 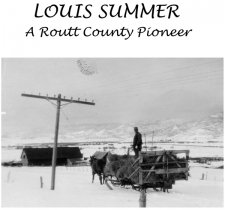 The story of the Summer family of Routt County is one from the �wild and wooly� West, transitioning into ranch life, anchoring his family to �the Mesa� and the Yampa River Valley they all loved.